Sparksey4869 Model Trains: Light up! After reading Darren's Christmas post on his problems with his DCC shorting when the trains are travelling through his points when they are thrown in the wrong direction. I thought I would show my application of light bulbs which are wired in series with the frog that I found on the Allen Gartnier Web site for DCC. The Tortoise machine showing the light bulb wired onto the common terminal of the PCB. The other side of the bulb will be connected to the Dropper for the frog. The Red and Black wires you see are the power to the Tortoise motor. Not shown is the wiring to the N/O and N/C contacts. They will go on the the 2 terminals between the Red wire and the light bulb black wire. Here you see the Tortoise and light bulb in place. The blue arrows are pointing to the common wire from the Tortoise to the frog. With the point in the correct direction there is no light and the train works fine. With the point thrown in the wrong direction the bulb glows, yet you see the headlight still working on the CPH. 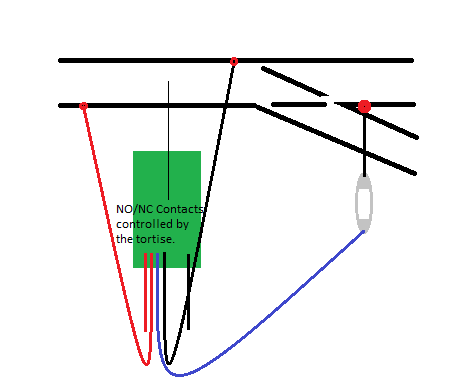 This means that the DCC has not gone out on a fault and the train will continue through the point. Unless it derails! The bulb in place, soldered to the dropper from the frog section of the point. 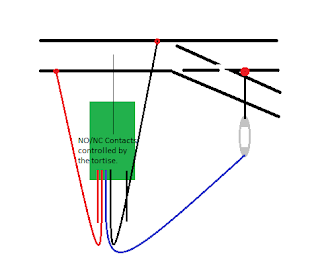 A dodgy schematic to show the connections. Many thanks for sharing this one Ben. I am thinking that the issue of a "bung" and demotion to guard maybe another option, or a bloody big stick!!! !